Yeah, well there may be a couple quid left in the Big Lottery fund that Tessa Jowell hasn’t swiped as yet to spend on some fairy lights and fireworks. From Beijing to Hackney Wick….. Yes, how will London top this? 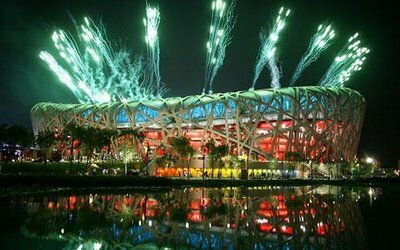 After all, in the world of the Olympic Games, each opening ceremony must be more flamboyant than the previous one, so how can impoverished, knackered Britain hope to get anywhere near what rich, confident China has done? I remember the day when it was announced that London had won the 2012 Olympic siting competition. In Trafalgar Square, there was a carefully-arranged spontaneous outpouring of joy. In the café where I ate my lunch that day, just behind Waterloo station, no more than half a mile away, people were saying how it would mean more expense for ordinary folk, higher council tax, distorted infrastructural development in London (my contribution), and other realistic worries. Here’s a suggestion. Break from tradition. As London couldn’t possibly top China’s big show, why not do away with the opening ceremony altogether? Get rid of all the non-sporting paraphenalia — none of this ceremony has anything to do with sports — and get stuck straightaway into the running, jumping and all the rest of it. A low-budget Olympics; less expense for the likes of you and me in London, more time for people who like to watch sports. Yes, what’s wrong with the egg & spoon race? Or rolling cheese truckles down gentle sloping verges? I think some of our athletes would look very attractive in hessian for the sack race. Anyway, I want my Hackney Marshes back!!! Its hype like this that was responsible for poor old Saakashvili making a terrible error. Perhaps in 2012 the small-bore shooting events could be held down the way in Lower Clapton Road. The local lads could probably outperform any Olympic team. Seeing that some of the display in Beijing was CGI-generated, and seeing that the vast bulk of spectators will be watching on the telly, why not have the entire 2012 opening palaver produced on a computer. Have a few fireworks at the main arena (if they can get anyone in there as it will probably still be filled with cement mixers and scaffolding), and do the rest of the ceremony on a PC or Mac in the studio for the telly audience. An ex-Brixton resident writes: it should in fact be referred to as the North London Olympics. Can anybody actually explain to me why people will get up in the small hours to watch sporting events which they have never seen or heard of and do not understand in order to cheer on people who they do not know?